Product categories of Industrial Ethernet Switch, we are specialized manufacturers from China, Small Industrial Ethernet Switch , Industrial Network Switch suppliers/factory, wholesale high-quality products of Industrial Gigabit Switch R & D and manufacturing, we have the perfect after-sales service and technical support. Look forward to your cooperation! Industrial Ethernet Switches is made with industrial Temperature (-40~75ºC ) Components. N-NET has over 200 models Industrial Ethernet Switches with the vast array of options including 10/100M,10/100/1000 Ethernet, PoE and fiber.N-NET offerS 4 Ports, 8 Ports , 16 Ports , 24 Ports , 48 Ports Industrial Grade Switches. 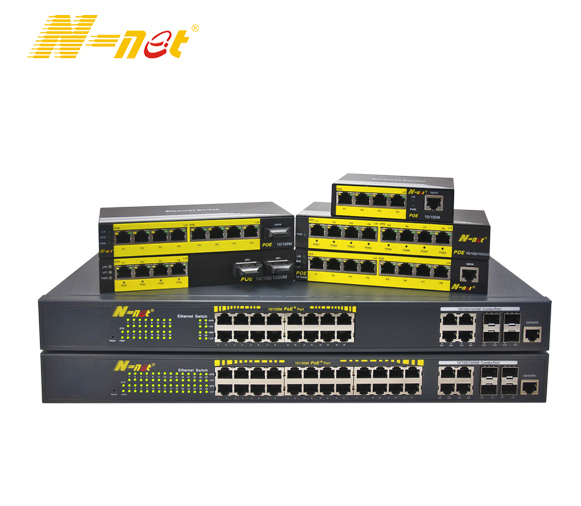 N-NET develops new Gigabit fiber ring network Management Industrial Ethernet Switch, which supports for port based VLAN, IEEE 802.1Q VLAN and GVRP protocol, simple network planning. supports SNMPv3, IEEE 802.1X, HTTPS and SSH, enhance network security.